The recent trouble with my hands brought me back to cotton in a big way. 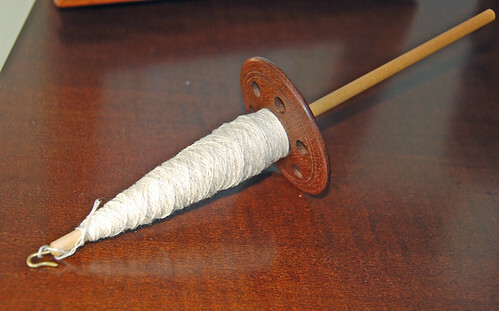 Of everything else only my cotton spin had a gentle enough action for longer stints. A low stool: sits in front of my couch, and under my lap level. It is comfortable, and with pillows at the base of my back, I do not need to lean forward. The new ergonomics awareness means that I don’t want to raise my drawing arm (left) above shoulder-level. This set-up helps a lot. A big shell: it’s from Michael’s. I love the haptic feedback from shell ridges when the metal takhli tip moves, slows, stops. It breaks through the concentration I have with drawing cotton back into each make of yarn. The lower half is a carved blade designed to be tucked at the waist. Slid to my left-side in between the couch cushion & arm it angles perfectly towards the stool set-up. I first did this in another bid to focus on the twist, and fine-tuning with a second draw. It’s also perfect for taking all weight off the injured left wrist. 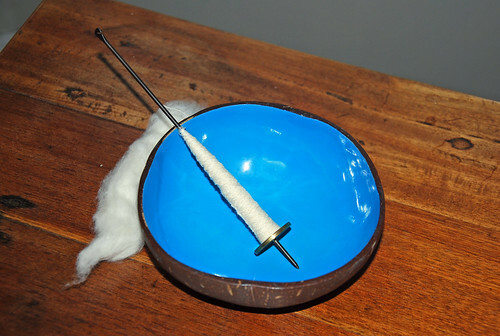 As I started to prepare 2-strand plying balls, I remembered some other incomplete cotton spins. So much was just waiting for me to wake up! By sheer co-incidence my copy of “Exotic Fiber Spindling” by Amelia Garripoli had just arrived in the mail. To my delight, Amelia bases her discussion on the Akha spindle. 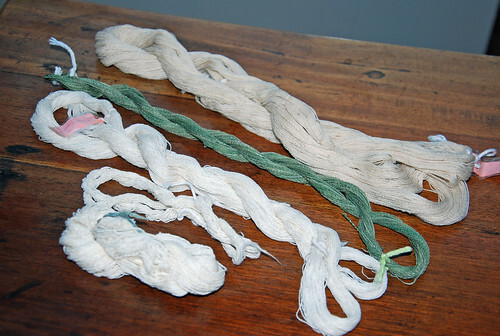 It is the style used by the northern hill tribes of Thailand, traditionally for cotton, and other short fibres. Out came my empty Tom Forrester Akha spindle. 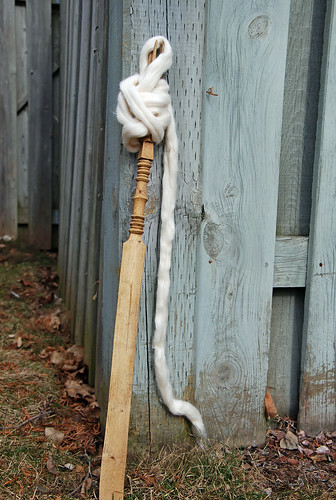 She came from Carolina Homespun last spring and is 20g with a lovely Sapele Mahogany whorl, and a Birch shaft. Light enough for achy hands & fine cotton! By mid-March, I had 5 skeins of 2-ply cotton in a finishing boil. 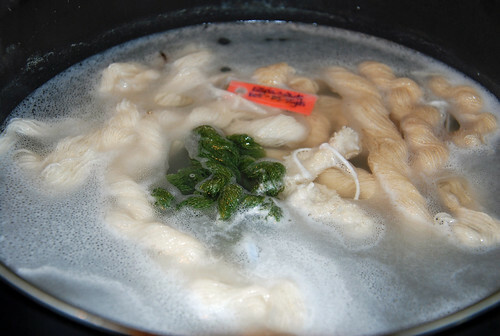 The recipe is from Stephanie Gaustad’s “Spinning Cotton” Interweave video but is a 40-minute boil in an alkaline bath to clean & set the cotton. The green yarn is the most special of the lot. It came from Phreadde’s gift of home-grown seed cottons, and I have shown/thanked her in FOAY already. The metal tip of takhlis move at an amazing speed. One light flick is all it takes. Getting feel, noise, and skating all within good parameters has sent me searching out different surfaces. I love the shells but dislike ceramic & wood. This painted gourd is from Ten Thousand Villages, and seems to work fairly well with both takhli & African clay bead spindles. It reminds me of calabash from home but is not made in Jamaica. My next experiment will be a condensed milk tin. It leaped off the page of the Spring 2014 issue of Wild Fibers Magazine. The phang spinners of Pangong, India seem at-one with my people when it comes to loving ‘tin milk’! 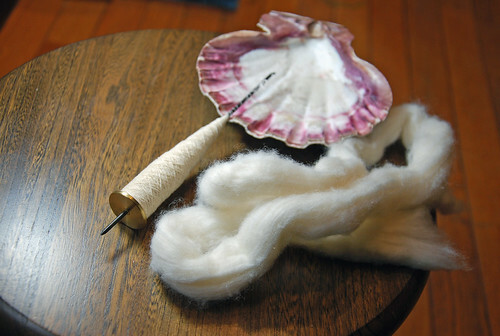 Categories: Getting the knack, Spinning, Stash in; Stash out | Tags: Akha spindle, cotton yarn, handspun yarn, Spinning, takhli spindle | Permalink.